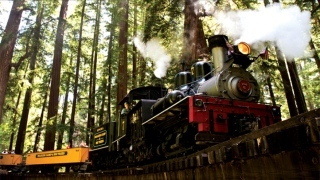 A Roaring Camp Railroads train. Eight passengers were injured Monday afternoon aboard a family-oriented train that takes passengers through the Santa Cruz Mountains. Emergency dispatchers said it happened as the Roaring Camp Railroads train was riding through redwood tree forests, NBC affiliate KSBW reported. The train was coming to a stop point on the track at a turnaround point, according to Felton Fire Chief Ron Rickenbaugh. Apparently, the throttle stuck and the train hit the hillside at track’s end, causing a severe jerking action. Several ambulances were sent to the train theme park along Graham Hill Road in Felton. Four people suffered moderate injuries and were transported to local hospitals, Rickenbaugh said. Four others suffered minor injuries and were treated at scene. The most seriously injured passenger fell and landed on her head, dispatchers said. Rickenbaugh said all of the victims were adults except for a 4-year-old girl. She was one of those taken to the hospital. Roaring Camp Railroads operates trains from Felton to the Santa Cruz Beach Boardwalk and another route that travels up Bear Mountain. The schedule posted on the outfit's website indicated Monday's train was headed up Bear Mountain. All of the uninjured passengers were towed back to the station by another engine. The park has been closed while the incident is under investigation.